Oniken is a 2D platform action indie game that make use of 8-bit graphic style. Everything on Oniken, from the character design to the music, is a tribute to the 8-bit action games from the NES era. 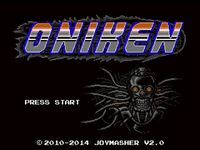 So if you like old-school games be prepared for Oniken and remember... Oniken is NES hard!